Yesterday we did some poaching, murdered a family pet, accidentally pinned the blame on some other guy, then killed him, then got paid for it. That's a pretty good day in my book, but now Norman thinks we need to flee the region for a while. 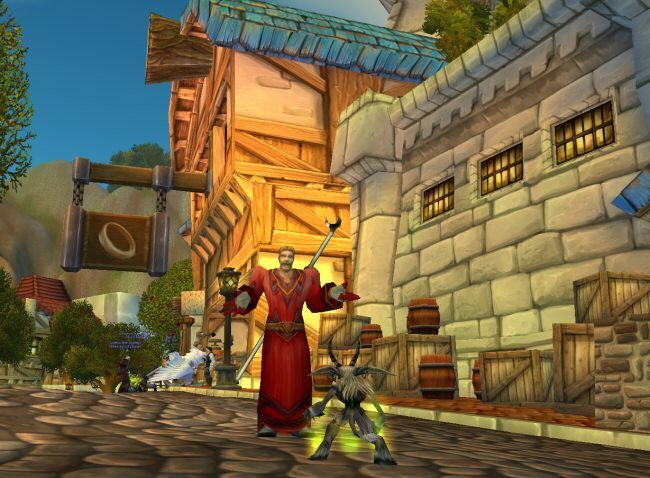 So now we're in the human city of Stormwind. Norman is here to gather his things and get ready to leave for good. He also stops at the shops and puts some of his hard-won adventuring money to use. "Hey, you got yourself a new dress!" I tell him. "It's not a dress, it's a robe!" he argues. "Don't be so hard on yourself," I tell him. "It's pretty no matter what you call it." "It's hard to be manly when you have to dress like this." "So why do it?" I ask. "I thought ... This is part of being a warlock. It's in the rules. I just assumed it was something demons wanted." "Nah. You idiots came up with that on your own." "Oh," Norman says with obvious disappointment. "Look, the only thing we demons care about is devouring souls and destroying worlds. The dark robes, midnight gatherings, virgin sacrifice, cutting yourselves, memorizing oaths to fallen gods ... that's all stuff mortals added so they could feel like they were doing something really dangerous and illicit. You guys have to make everything so complicated. Power for souls. That's our business. You guys can dress it up however you like." "I guess I feel sort of stupid wearing this robe then." "There's a good reason for that," I say. We leave town and head west. 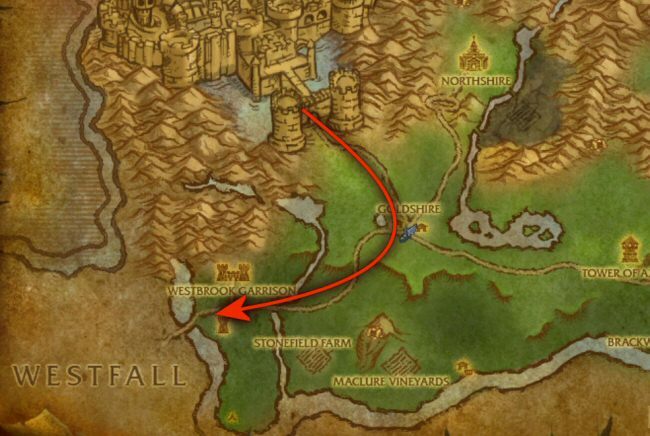 We're headed for Westfall, where Norman hopes he will find people in need of help. Along the way, Norman runs off the path and starts digging around in the weeds. "Why are you picking flowers?" I ask. "They're not flowers, they're herbs. 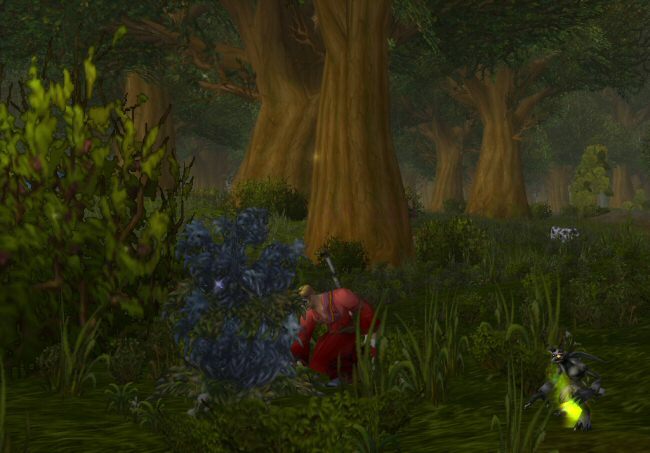 I've studied a bit of herbalism." "And Alchemy. Picked it up in mage school." "Wow. You know Alchemy?" I'm actually kind of impressed by this news. "What kind of potions can you make?" I ask. "A few. I can make one that sort of heals you a bit." In most crafting professions, the first-tier of stuff is hilariously weak. It does get better at higher levels, though. "Let's say you got impaled on a spear," he explains. "This potion would reduce the redness and irritation around the entry point, at least until you can find someone to pull it out. I've also got another one that hardens your skin, so if someone wanted to impale you they would have to push 1% harder." I shake my head, "Wow, I didn't realize you were horrible at other things before you went on to be horrible at magic. You're a real jack-of-sucking-at-all-trades." "You sound like my mother," he whines. "She's never been happy with anything I've done since I decided not to become a paladin." "I'm not here to help you with your personality problems. Let's find someone to set on fire." "We don't need to immolate everyone we meet, you know." "Hey, if people didn't want to be set on fire, then why do they make such hilarious sounds when you do it? That's practically asking for it." "I don't think they make those sounds to entertain us." "Well, I appreciate the effort they put into it anyway."